"A Man of His Word" by Kathleen Fuller is "wunderbaar, wunderbaar." Wunderbaar translates from Dutch to English. It means wonderful. Because of this book I most definitely will look for all of Kathleen Fuller's books. With all of their struggles I enjoyed spending days with the families who live in Middlefield, Ohio. By the way, Middlefield, Ohio is a real Amish community. The author gives a detailed view of the setting, the community, in "A note from the author." Throughout the book Kathleen Fuller strives not to leave out any details about this fictional family in Middlefield, Ohio. To make reading easy the author also includes a Dutch glossary at the beginning of the book. This is very helpful. However, Kathleen Fuller writes so clearly and simply I rarely needed to use the glossary. Still, I felt secure with it there in the front of my book. 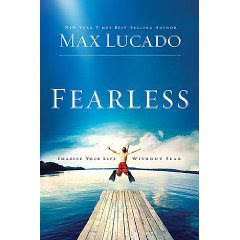 "Fearless" by Max Lucado is a wonderfully inspiring book for any person who actively lives with fear everyday. I don't mind admitting it. I deal with anxiety everyday. Throughout the night I worry about my children and grandchildren. While I worry, my husband sleeps peacefully. Of course Christian radio is always on in his car too. However, Max Lucado's book, "Fearless" is proof that our lives go through seasons. It is not impossible for Jesus to change a person of fear. He can make any person full of courage. The process begins with the opening of this magnificent book.